I Hate You Messages for Ex-Husband: Divorce can shatter lives in a way that can never be imagined. The heartbreak of walking away from a marriage is amplified by struggles that ensue. Whether it was cheating, betrayal or a lack of love – you will be able to relate to the messages and quotes in this post if your husband was responsible for your split. Read them and reflect on your anger and frustration towards the man who broke your heart. Spend a few moments in private to give your emotions a well deserved outlet. If appropriate, channel your feelings into a message and push it out as a Facebook post or a tweet without taking any names. Let your husband realize that you will never forgive him for forgetting the vows and promises he made on your wedding day. 1) On the day that you walked away, you completely shattered my life. You make me regret every moment, that I lived as your wife. Not even time can heal my wounds, because they are so deep. I may pretend to move on, but my heart will forever weep. I hate you. 2) Divorcing you is something that I never wanted, but you took me and my love for granted. Splitting apart was the only way out, because you have been a jerk throughout. I hate you. 3) I forgot to read the fine print on our marriage certificate which said ‘Beware of a cheating husband’. I hate you. 4) If I knew that lusting after other women was one of your hobbies, I would have made spying on you a hobby of mine. I hate you. 5) I can’t sleep on a bed which has been smothered with another woman’s scent, and I can’t be with a man whose morals are so bent. I hate you and regret each and every single moment. 6) I put everything I had into our marriage, you put everything you had outside it. I hate you. 7) Word’s can’t describe how much pain you have put me through. I just hope that karma never forgives you. I hate you. 8) You forgot all the vows and the promises. You forgot all the love and care. You forgot all the little things that matter. You forgot all your duties and responsibilities. I hate you for taking things so lightly, I hate you for making us drift apart. I hate you for being so selfish. I hate you for mercilessly breaking my heart. I hate you. 9) For the way you have betrayed and cheated, you are a man worthy of nothing but hatred. I hate you. 10) The difference between you and me is that our divorce was just a chapter in your life’s book whereas it was The End in mine. I hate you. 11) I thought we were mature enough as a couple to leave petty issues behind. Little did I know that you had other plans in your dirty mind. I hate you. 12) Our divorce changed our lives – you got freedom while I got heartbreak. I hate you. 13) My husband, I forever wanted you to be. My undying love, you never cared to see. I made many sacrifices, so we could be happy. But now everything is in vain, since you chose a separate destiny. I hate you. 14) If lusting after other women was your fancy, why did you decided to marry me. I hate you. 15) The problem with our marriage was that you wanted freedom from the responsibilities of committing your life to me, while I saw my freedom in committing my life to you. I hate you. 16) I lusted after the man I loved, not knowing that his love for me, was lust in disguise. I hate you. 17) The most unfortunate part of our divorce is that in reality, there are no winners. I don’t care about my heartbreak because our children are the real losers. I hate you. 18) I always knew that marriage was going to be all about sacrifice but I never knew that all the sacrifices had to be made by me. I hate you. 19) You should be ashamed of the way you have shunned responsibility. You have ruined your wife’s life and marred your kids’ destinies. We will never forgive you for the way you left us all in misery. I hate you. 20) Our wedding day was pristine and so beautiful. Our married lives were loving and so perfect. Everything became bitter and sour, because of your carelessness and neglect. You never bothered to show even a little bit of care. Not once, did you ever show respect. You have totally changed as a person, which is why our marriage has been wrecked. I hate you. 21) The vibrant colors of our marriage were marred by your dark thoughts. I hate you. 22) Every marriage has its own problems, flaws and faults. The only difference is that in ours, I tried to fix them while you ran away from them. I hate you. 23) Husbands are supposed to be caring and loving. How did you turn out to be so evil and cunning? I hate you. 24) In our marriage I always thought that lust and love was intertwined. Little did I know that you had another woman on your mind. I hate you. 25) Were you asleep when we took those wows on our wedding day? Because you have broken them in almost every possibly way. Not even for once, did you think about the consequences of your behavior. Now I cringe at the fact that I was betrayed by you, someone who was so dear. I hate you. 26) Only a monster like you can turn a marriage from a beautiful union to an ugly regret. I hate you. 27) Marriage – it brought out the best in me and the worst in you. I hate you. 28) As a father I thought you would be more caring. As a husband I thought you would be more loving. Never in my wildest dreams did I imagine that you would be so conniving and deceiving. I hate you. 29) The worst part of divorce isn’t the hardship that follows. It is the regret of devoting and wasting all the precious years of my life for a man like you. I hate you. 30) The only problem with our marriage was that you saw it as one. I hate you. 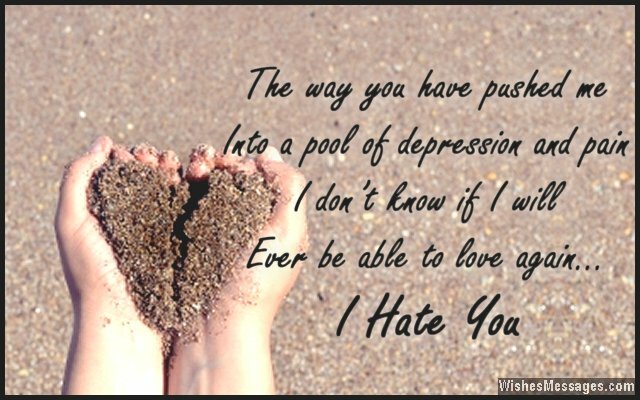 31) The way you have pushed me into a pool of depression and pain, I don’t know if I will ever be able to love again. I hate you. 32) Don’t worry about my heart because it is already broken. But who will explain your betrayal to the children? You have polluted their young minds with your dirty actions. I hope that you never get any redemption. I hate you. 33) Destiny had carved out the perfect future. We had everything going for us. But you had to screw everything up. You turned a blessing into a curse. I hate you. 34) I hate my ex-husband from the very core. I hope that for him, life has only bitterness in store. 35) Everyone makes compromises and sacrifices in life. It’s a pity that I made mine for a loser like you. I hate you. 36) For the way you have ruined my life forever, I hope that you fail in all your endeavors. Fate will make you pay for your horrible actions. I hope that life shows you no mercy or compassion. I hate you. 37) Before our wedding, you were such a sweet and caring guy. But you became a heartless human being, as time went by. I was over the moon when I walked down the aisle to marry you, unaware of the sorrow and sadness I was pushing myself into. I hate you. 38) Not once did you care to think, how your actions would ruin my life. You are a selfish monster, who never cared for his kids or his wife. I hate you. 39) For you, hate is the only thing I will harbor in my heart. You treated me like a slave, from the very start. I regret the fateful day when we got married, because that is when I pushed myself into a life so horrid. I hate you. 40) For how conveniently you made your way into another woman’s bed, I just wish you were dead. I hate you.